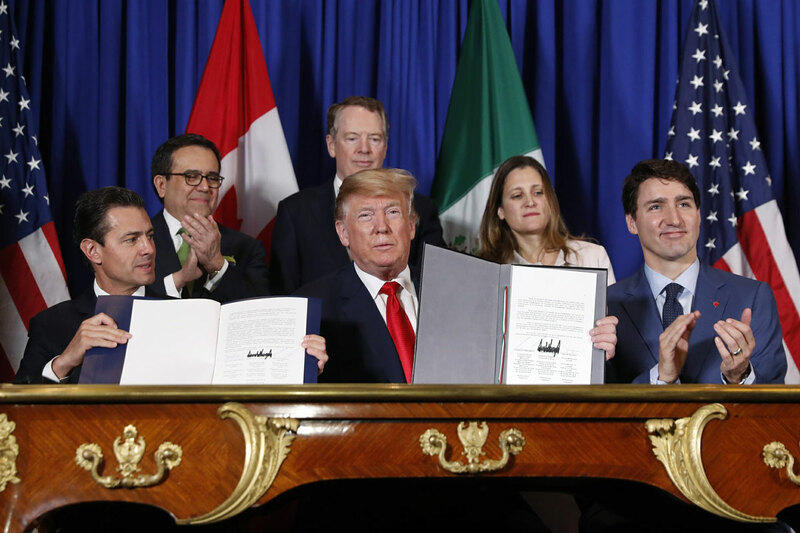 President Donald Trump teamed up with the leaders of Canada and Mexico on Friday to sign a revised North American trade pact, a deal that fulfills a key political pledge by the American president but faces an uncertain future in the U.S. Congress. The celebratory moment was dimmed by ongoing differences over Trump’s steel and aluminum tariffs, as well as plans for massive layoffs in the U.S. and Canada by General Motors. Trump appeared with Canadian Prime Minister Justin Trudeau and outgoing Mexican President Enrique Pena Nieto at the Group of 20 nations summit in Buenos Aires for the formal signing ceremony. Each country’s legislature must also approve the agreement. Legislative approval is the next step in the process, but could prove to be a difficult task in the United States, especially now that Democrats — instead of Trump’s Republicans — will control the House of Representatives come January. Democrats and their allies in the labor movement are already demanding changes to the agreement. “With hard work, good will and determination I’m confident that we will get there,” Trudeau said. The new agreement requires that 40 percent of cars eventually be made countries that pay autoworkers at least $16 an hour — that is, the U.S. and Canada and not Mexico — to qualify for duty-free treatment under the trade pact. It also requires Mexico to pursue reforms of labor law to encourage independent unions that will bargain for higher wages and better working conditions for Mexican workers. The signing came at the front end of two days of tough diplomacy for Trump. On the top of his agenda is a Saturday dinner meeting with Chinese President Xi Jingping that will determine if the two can ease escalating trade tensions. Before Trump arrived in Argentina he injected additional drama into the proceedings by canceling another high-stakes meeting, with Russian President Vladimir Putin. Trump opened Friday with a cordial meeting at the Casa Rosada with Argentine President Mauricio Macri, a longtime business acquaintance. Posing for photos in the gilded Salón Blanco, Trump spoke about their longtime personal relationship and said they would discuss trade, military purchases and other issues. “We’ve known each other a long while,” Trump said, noting he worked with Macri’s father on real estate developments. The businessman-turned-politician joked that when he and Macri first met they’d never have imagined their future roles on the world stage. Macri is hosting the summit as he struggles with problems at home. He is trying to halt economic turmoil that has caused the steep depreciation of the Argentine peso. Trump, who arrived in Buenos Aires late Thursday, barreled into the two-day meeting by announcing via Twitter that he was canceling the planned meeting with Putin over Russia’s seizure of Ukrainian vessels. His agenda for the weekend includes meetings with world leaders, as well as a number of heavily choreographed group activities for the gathering of leaders of rich and developing nations. The president canceled on Putin not long after his former lawyer, Michael Cohen, revealed he had lied to Congress to cover up that he was negotiating a real estate deal in Moscow on Trump’s behalf during the Republican presidential primary in 2016. The news ensured any meeting with Putin would have put a spotlight on the special counsel’s investigation into whether the Trump campaign colluded with Moscow during the campaign. Trump has denied any wrongdoing. One looming question is whether Trump will have a run-in with Saudi Arabian Crown Prince Mohammed bin Salman amid global dismay over the murder of Saudi journalist Jamal Khashoggi. U.S. intelligence officials have concluded that the Saudi crown prince must have at least known of the plot to kill Khashoggi, who was critical of the Saudi royal family. Lawmakers in both parties have called on Trump to at least avoid the young heir apparent as punishment.